Premium coffee service is entering the mid-scale hotel segment in ways unimaginable even five years ago. Driven by ever-more-discerning American coffee drinkers demanding a better cup of joe, midscale lodging groups are upgrading to premium brews as never before, as reported in Hotel Management Magazine, which was posted February 28, 2017. Senior hotel, food-and-beverage and coffee company executives say they are focused on everything from improving lobby coffee service to unlocking new revenue streams to enhancing the guest experience via a flavorful brew served as a complimentary amenity. Such innovation and change are clear signals that premium coffee has gained ground and penetrated the midscale lodging tier in ways unimaginable even five years ago. And, fortuitously for midscale hotel owners, the costs in climbing the ladder of coffee quality are surprisingly slight, as little as a penny or pennies on the dollar. “Within the midscale tier, up until the last three or four years, coffee was just coffee and any coffee would do, but now, thanks to Starbucks and other premium coffee roasters, our guests are more interested than ever in a flavor, a special roast and a better cup of coffee,” said David Neves, corporate director of F&B for IHG. To implement an upgraded coffee service, Neves led an intensive two-year study researching coffee. He polled guests, conducted blind taste tests and solicited input from coffee purveyors. Ultimately, IHG’s Holiday Inn and Holiday Inn Express brands selected Keurig Green Mountain and Royal Cup Coffee and Tea as their two partners at more than 3,000 locations in North America. “We were the first in our category to mandate Keurig K-Cup equipment in all our Holiday Inn and Holiday Inn Express locations across the United States and Canada,” Neves said, noting that the upgraded coffee is a free amenity at every property. Coffee bar in Red Lion Hotel Lobby. Photo courtesy of RL. While premium coffees, espressos, lattes and cold brews—often accompanied by individualized coffee service from in-house baristas—have been present, featured and served within the luxury, upper-upscale, upscale and upper-midscale hotel segments for some time, demand for specialty coffee is fast percolating through the midscale lodging tier. 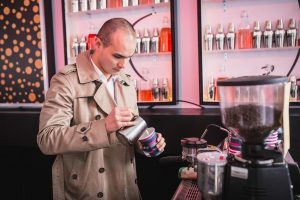 From lobby to room, the “premiumization of coffee” trend is on full display at Wyndham Hotel Group’s Baymont Inn & Suites, Days Inn, Howard Johnson, Super 8 and Travelodge brands, among others, said Lisa Checchio, Wyndham Hotel Group’s VP of brand marketing. An Aloft guest fills up before heading out. According to Mark Southern, director of product innovation, F&B for Hilton, specialty and premium coffees are going to tip over to the mainstream sooner than later in terms of midscale brands. 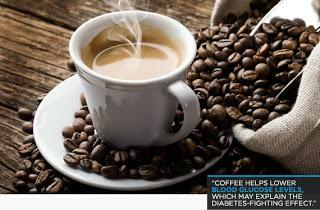 At Hilton’s new Tru midscale brand, Italian coffee purveyor Lavazza will be served exclusively. Southern said that Hilton likewise offers premium coffee service at its Hilton Garden Inn, Homewood Suites and Home2 Suites, among other company brands. Viewing U.S. coffee trends over the past 20 years, Michelle Burns, SVP of channel development, branded solutions for Starbucks Coffee Company, said there is a growing sophistication among U.S. coffee drinkers. “In viewing the journey of coffee, what is fantastic is the breadth of what the lodging industry has achieved,” she said. According to Burns, Starbucks is now rolling out on a national basis its Seattle’s Best Coffee liquid concentrate in half-gallon containers. Designed to target the company’s lodging, convention and hospitality customers, the concentrate can serve up to 790 five-ounce servings. 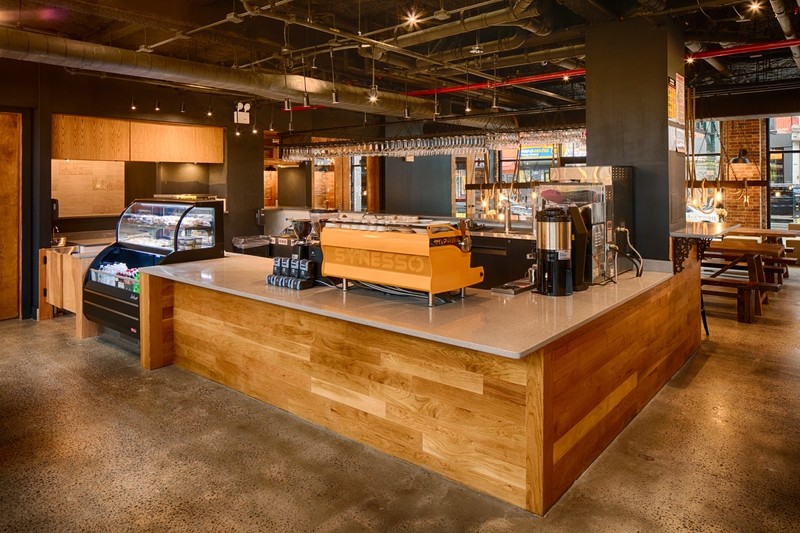 At Moxy, Nespresso is featured in the lobby as a free “grab and go,” while at Elements, Starbucks is featured along with breakfast in the lobby. Coffee appreciation among Americans is very much in evidence among one of the country’s most influential, and now largest, demographic groups: millennials. Prompted by growing numbers of coffee-savvy millennials staying at midscale properties, coffee premiumization at midscale brands is very much the order of the day. “Coffee is being driven by millennials; they’re a most powerful cohort,” said Shelly Tallabas, director of customer and market insights with Farmer Brothers Coffee. Farmer Brothers works with scores of chain and independent hoteliers across all lodging segments, according to Tallabas, and offers a range of coffee and teas from branded coffees to specialty brews. For all the focus on elevating the guest experience and, for some operators, offering better coffee grades as a free amenity as part of that strategy, the cost of implementing a coffee upgrade to midscale lodging owners and franchisees is minimal. As a general rule, the cost to a typical midscale hotel for free breakfast and coffee service in the morning comes to about 4 percent a year in a property’s overall operational expenses, with coffee’s share much less than 1 percent, IHG’s Neves said. In a hypothetical case, if the property is paying $3 a pound for coffee, this comes out to a penny or less when calculating a hotel’s overall annual operating costs. 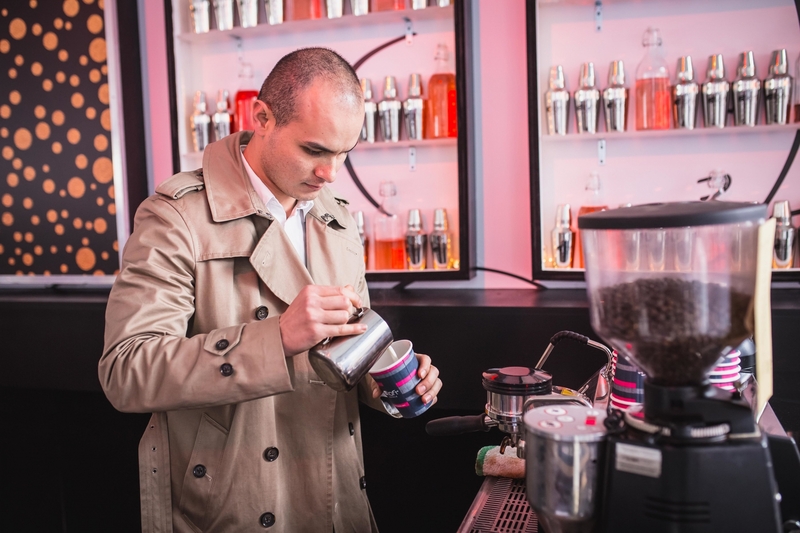 However, if a hotel brand is paying $10 a pound for an ultra-premium coffee, then it’s a different story for the operator, Neves said, which would likely be for a luxury or upper-upscale hotel. EDITOR’S NOTE: The author wishes to thank the Editors of Hotel Management Magazine for permission to reprint this article.